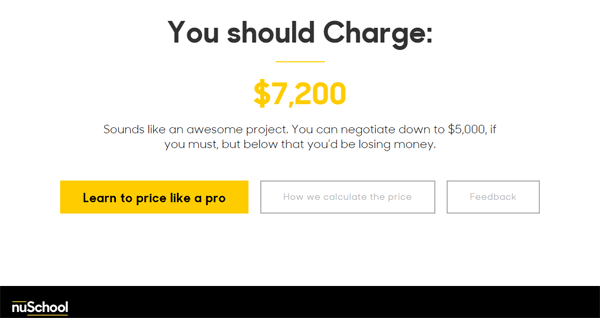 If you need help determining what price to charge for a particular design project, check out this site by nuSchool (a company that provides online education for creative professionals) called How Much Should I Charge? The site will ask you some simple questions about the design project and then show you what it thinks the price should be for doing it. The price is calculated by multiplying your hourly rate with the number of hours the project will take up, and also factors in how important the project will be for your long-term design career. The site can give you a super-rough guideline if you have absolutely no idea what price a design project should cost. How Do You Price Your Design Projects? When a potential client asks you how much you charge, how do you answer them? What’s your process for developing a price quote for a prospective client? Do you have trouble with requests for proposals (RFPs)? Tweet us to share your stories!